A 21yr old female who reads because she believes that living life from one perspective is too boring and that critiquing those perspectives is inevitable. | Created on the 8th of January 2015. Because this is a new blog and I really need something to help plan out what I will be posting here throughout the year, I thought why not go ahead and start my first reading challenge. According to the rules, you cannot use the same book twice for the same challenge. 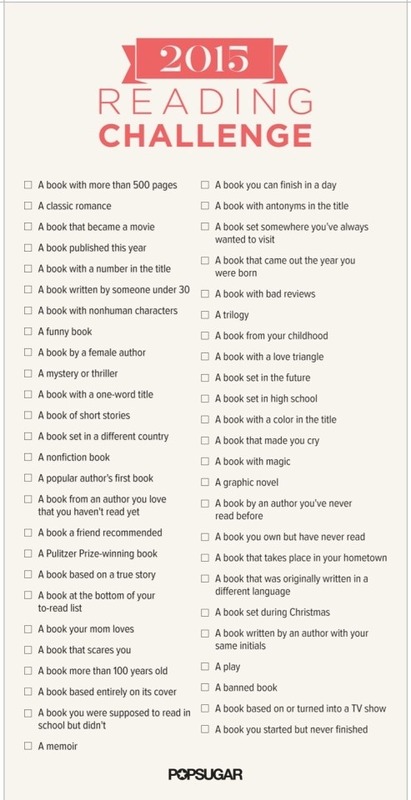 In other words, you can only tick one box per book even if the book is relevant and appropriate to more that one of the challenges below! Replaced A book mom loves, a banned book, and a book written by an author with your same initials with An Arabic book, a stand alone, and a novella – because 1. Mom hates books 2. I can't get my hands on a banned book 3. I couldn’t find an interesting author that has my initials, and 4. I need to read an Arabic book. Don't hesitate and join! If you have any questions, visit this link for further information.